Exhibiting artists at the German pavilion of the Venice Biennale have produced a piece in protest of the German government's austerity measure bailout demands from Greece. 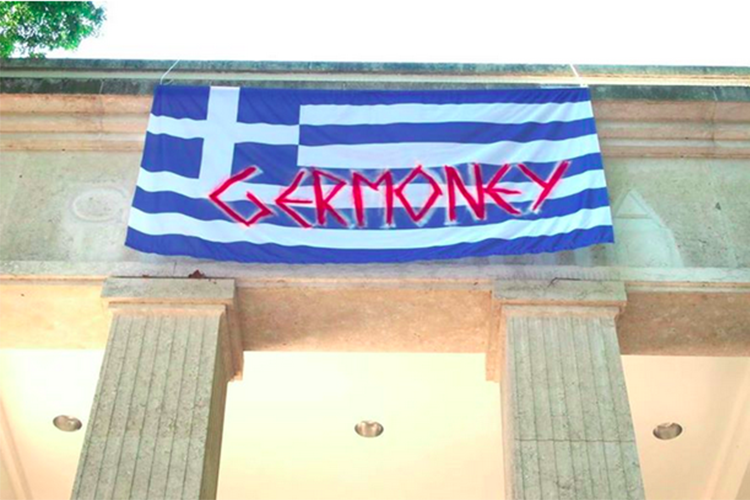 Hito Steyerl shared a photograph of the flag on her Facebook page, along with the post: ''Today, the artists of the German Pavilion and a number of the workers of the 56th Venice Biennial covered the Germania sign on the pavilion with a Greek flag and the word "Germoney." We show our solidarity with the people in Greece and all other places suffering from austerity. As cultural workers and artists we demand an end to austerity for health, culture and education while public funding for banks and oligarchs seems unlimited. #AusterityKills, #CancelGreekdebt, #Germoney"